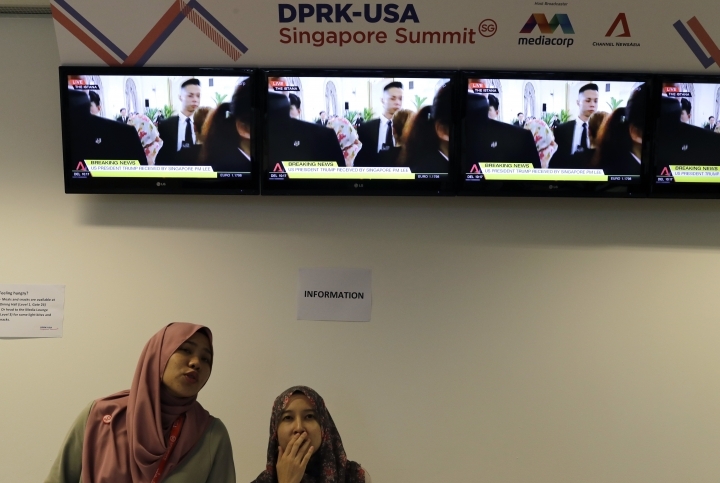 SINGAPORE — The tiny city-state of Singapore is hosting its largest media contingent ever for the summit between President Donald Trump and North Korean leader Kim Jong Un. They will be well fed, if nothing else. 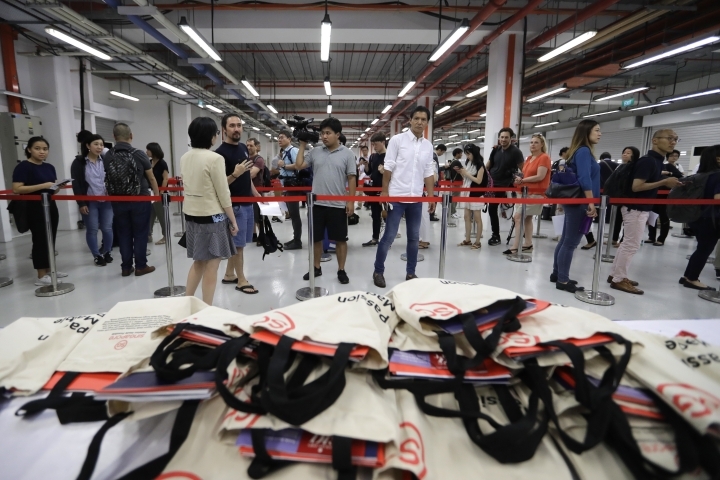 A sprawling 2,100 square-meter (23,000-square-foot) facility built for an annual Formula One race has been refurbished to handle about 3,000 journalists expected to cover Tuesday's summit. It is a good distance from the summit venue, and intrepid journalists will likely move out of the media center and try to get closer to the action. Hundreds of journalists gathered outside the hotels where Trump and Kim are staying and along the streets to capture their arrivals on Sunday. The police, though, have stepped up checks and surveillance in designated "special event areas" around the Capella Singapore hotel, where the summit will be held, and the leaders' temporary residences, Kim's St. Regis Singapore and Trump's Shangri-La Hotel. 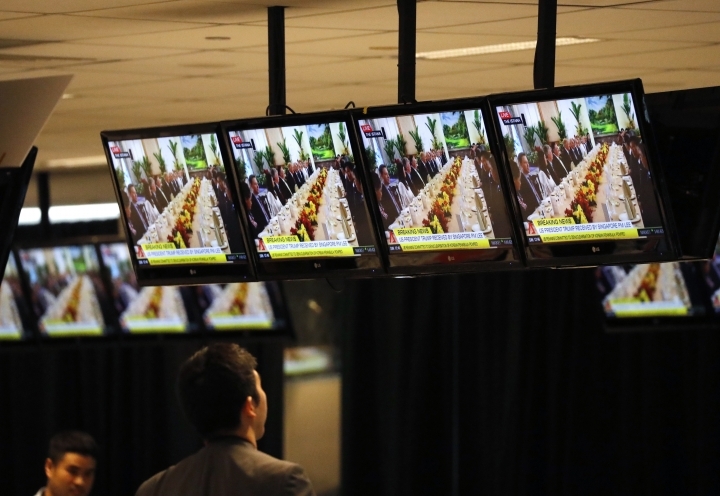 The media center is part of Singapore's $15 million bill for the summit, the bulk of which is going to security. Singapore, arguably the food capital of Asia, is treating journalists to a spread of more than 20 local and international favorites at meal times. There are quintessential Singaporean dishes, such as toast with a coconut and egg jam, chicken rice, and thick vermicelli in a spicy broth that's made with dried shrimp. Chia Chi Wei, a journalist from Taiwan and first-time visitor to Singapore, tried the famous chicken rice during a break: "I heard so much about it. It was very delicious." 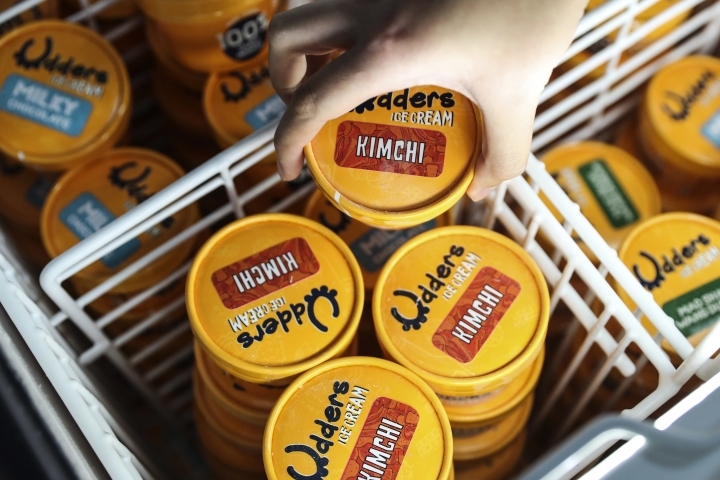 The Common Good Company, a group of local eateries, is offering ice cream made with kimchi, a spicy Korean staple. "I cannot remember an event that is as historic, as big, as global," said its director Wong Peck Lin. "What event is there in our history that has as many journalists from around the world all trained on Singapore?" 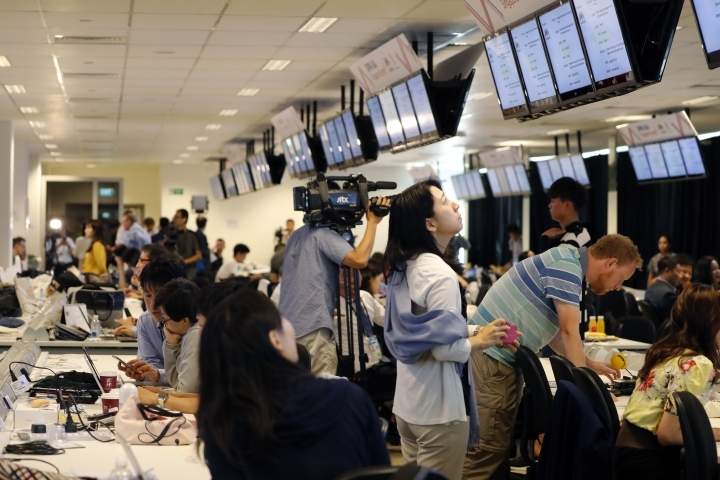 Belgian journalist Tom Van de Weghe arrived in the media center, luggage in hand, after a 30-hour journey. "The food is amazing. Who is paying for all this?" he said. Local businesses, it turns out, sponsored the lavish spread, according the city-state's Ministry of Communications and Information.